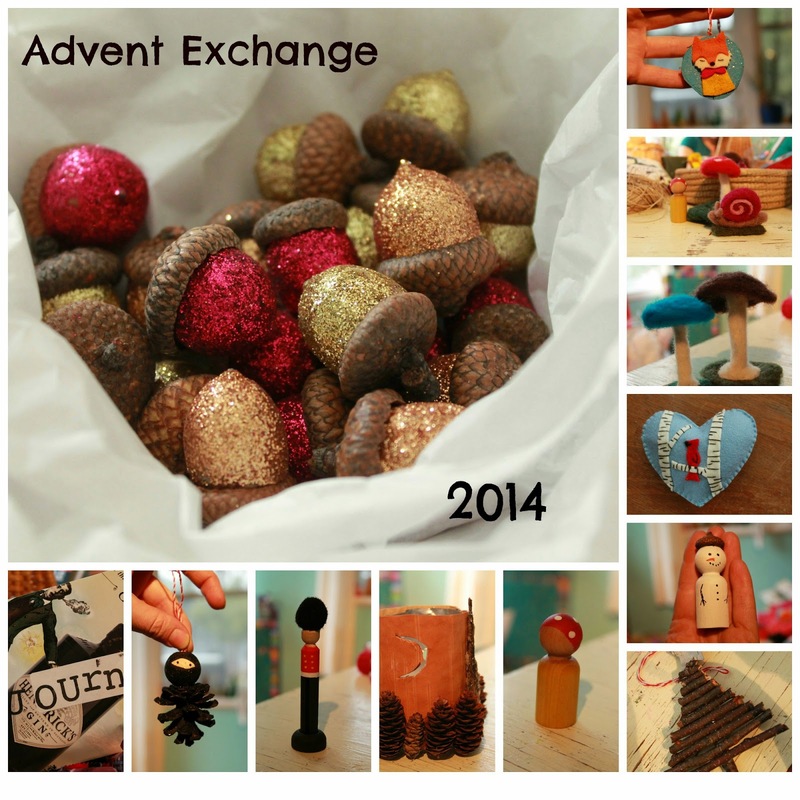 If you've been a follower of this blog for a few years, you'll know about our little Advent exchange. By "our" I'm including some dear friends: the dynamic duo behind Twig and Toadstool, the Wabi Sabi Wanderer, and the lovely blogger behind Embracing the Now. For years now, we have rallied our pre-Christmas energy, assembled our supplies, and spent our free moments lovingly hand-crafting little items to share with one another. It is a tradition that I can see continuing into the far future, and I dream of a day when we will gather to put together baskets for our grandchildren, perhaps inviting our own grown children to add their handmades to the gathering. This year, we welcomed two new members to our little group, so instead of creating 5x5 handmade items, we each created three different crafts, times seven. We filled in the little gaps with storebought items (such as candy, beeswax candles, etc.) 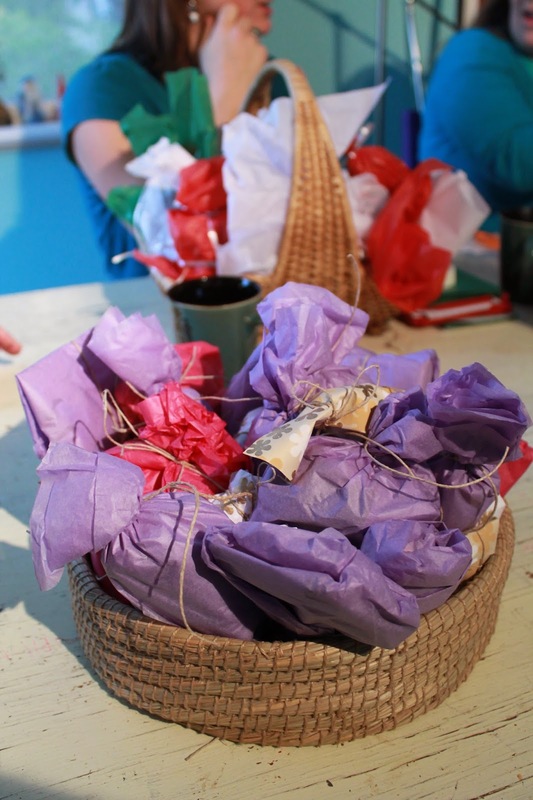 and pulled together a basket with 25 goodies for our children to open each day during Advent. As much as we are delighted by the creations of our friends, it is the gathering itself that ignites that first spark of excitement for the coming Christmas season. 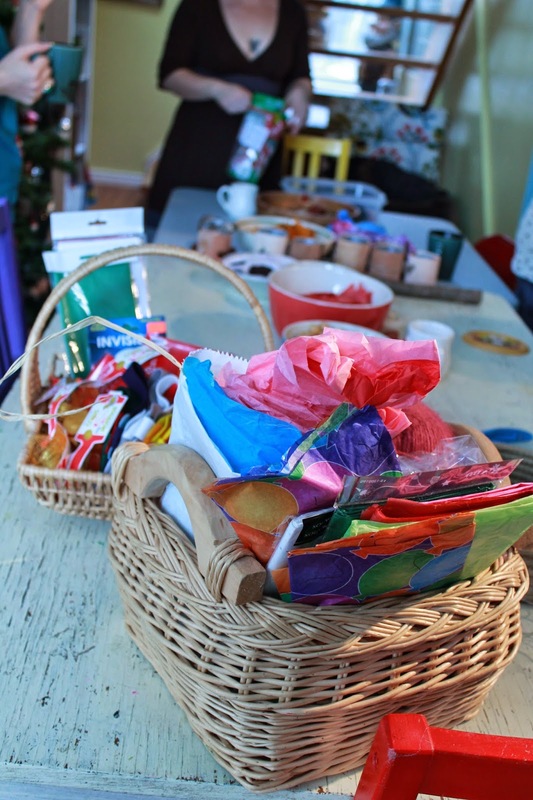 We arrive at the always-festive home of Maureen, and baskets, tissue paper, string, scissors, snacks, and coffee are scattered across the table. We do a little show and tell, then begin wrapping each item. Words aren't sufficient to describe the delight and awe with which each item is greeted, and the warmth that arises from knowing that human hands, those of people who actually know my children, created these little gifts. 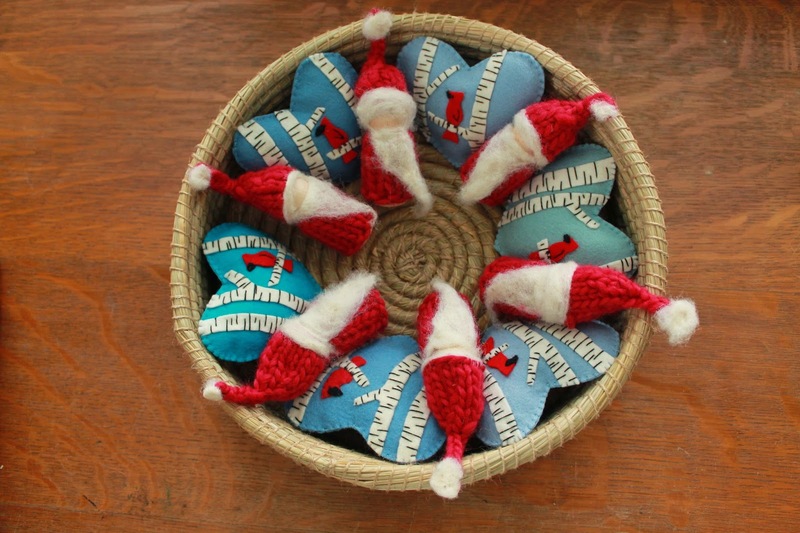 This gathering of kindred spirits is a quiet pause before the busyness of Christmas is upon us. We prepare our hearts, breathe deeply in the presence of dear friends, and set our hands to the task of wrapping. I remember the years past, when my tousle-headed children descended to open one little gift each day, and how I said the words, "Maureen/Erin/Shanti/the WSW made that just for you!" Now we'll add the names Gwen and Anya to the list of women who love my children enough to spend their free time creating beautiful gifts for them. Each year as we unpack our decorations, we remember Christmases past, and celebrate how we now have a tree full of ornaments that were made by hand, by women they know. My children feel the love. And so do I, so deeply. So pretty, and so very special! Lucky kiddies! Oh my word, you have done such a beautiful job of capturing this, from the awesome collage to the heartwarming words. Your writing is a joy to read. YOU are a joy to know.